Like any athlete, breathing is an essential component to your horse’s performance. From a simple cough during initial exercise to respiratory distress, Manning Equine is here to get to the bottom of the issue and recommend treatments to help your horse perform at its best. Endoscopic exams continue to provide effective diagnosis of a wide range of respiratory issues. Whether you are scoping guttural pouches or a trachea, the endoscope gives the veterinarian an eye inside the horse. Have a cough that just won’t go away? A bronochoalveolar lavage, or B.A.L., can help. This minor procedure is performed under mild sedation where a sterile liquid is introduced into the horse’s lungs, then instantly extracted. 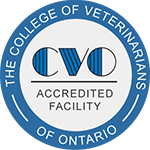 The sample is sent to Dr. Laurent Viel of the Ontario Veterinary College for further identification and treatment recommendations.